What I noticed about the image of the Women’s March on Washington was the color. I noticed how it was color coded as black and white with patches of pink orange and navy blue. I think that the person who did this photo choose these colors to stand out for it has meaning behind the colors that he/she wanted to show the world. I also saw the reaction of women of different races. How they look so proud and not afraid to show who they are. 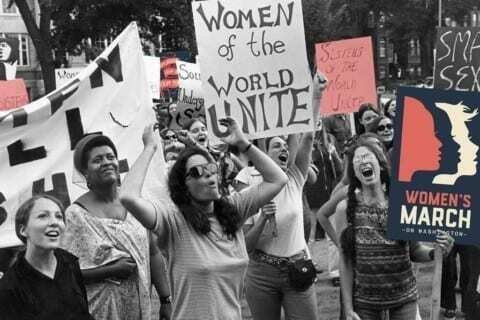 All women unite and stand together is what is being portrayed in this photo. It says a lot about women and how they can do things and come together as a whole and fight what they believe in. There are smiles in the photo which shows how proud they are to be a part of this march. Their faces say it all. Women’s March on Washington by Agnes is licensed under a Creative Commons Attribution-ShareAlike 4.0 International License.